Clickfunnels Squeeze Page: What Is A Website Squeeze Page? What Is A Website Squeeze Page? Squeeze pages, sales pages, upsell pages – anyone else feel like their head is stuck in a dictionary of marketing jargon? We’re here to set the record straight and explain exactly what a squeeze page is and what benefit it has for your business. It’s called a squeeze page because it’s designed to squeeeeeeze an email address (and possibly other details) out of a website visitor. In this article, we’re going to talk about what is a squeeze page and how it can help generate enquiries and eventually sales for your business. The definition of a website squeeze page is a single page designed to capture leads from prospects. There is one goal in mind, and that’s to obtain data in return for the purchase of a product. The product is usually free at this point to generate interest in your brand. You could give away anything (depending on the costs): a free trial of a service, link to a webinar or a downloadable eBook. Because a squeeze page gets straight to the point (a quick exchange), there is no room for confusion. It works because of the marketing messages going on behind the scenes that encourage people to enter your page- this is called a hook. Simply, it hooks them in by way of a targeted message. Getting to know your audience to ensure you have the right emotional triggers to encourage clicks? That’s a topic for another article. Knowing the difference between a landing page and a squeeze page will help you plan out your marketing strategy to perfection. It will also help you plan out the entire lead generation process. Why? Because there is a significant difference between these two pages. This squeeze page has a single offer, and that’s a downloadable guide (SEO cheatsheet) in exchange for a name and email address. It’s a simple, to the point and fuss-free squeeze page. The single objective is to collect data. It’s a classic example of a squeeze page with an ultimatum: you either take the product or leave, empty-handed. 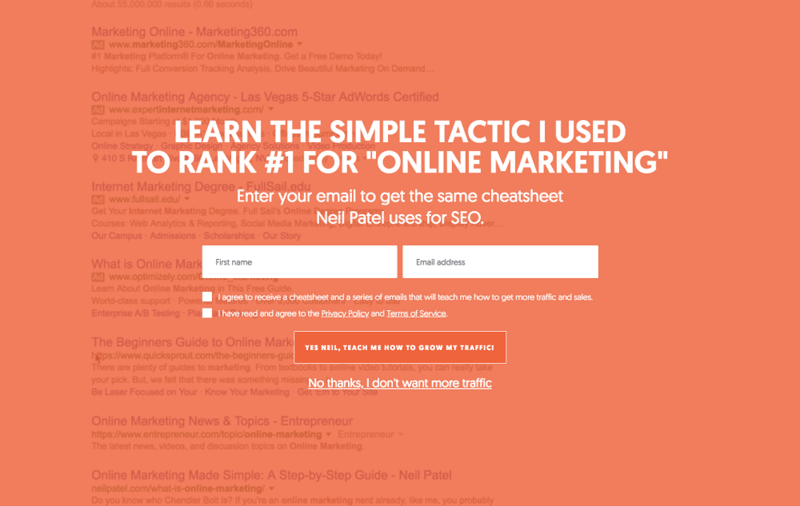 There are no hyperlinks that distract you or direct you to another landing page. Short copy that gets to the point, quickly! One call to action button that stands out. Russell’s Clickfunnels squeeze page is clearly targeted at Business Owners and Marketing Managers who are looking to up their sales game. You can tell this because he gets straight to the point in his subheading ‘99 Marketing Secrets That Will Change Your Business… And Change Your Life.’ This ticks the curiosity box, for sure. The landing page is the next step in the funnel following a successful squeeze page completion. Those who sign up to download a free resource on the squeeze page are led further into the marketing funnel. You have given away a complimentary resource offering great value (thumbs up!) Your readers trust you to deliver a great service. Now, it’s time to hit them with an amazing offer they can’t refuse. Your landing page will break down an offer. Not a product, but an offer. Every business is competing on price. It’s an on-going battle starting with your highest possible price and rapidly lowering it to meet consumer demand. An offer is a little different. Think of it as a bundle. So, all your products, services and resources are sold together. That will look incredible to a prospective customer. The perceived value will be high. When in reality, the cost of production on your end is dirt cheap. It’s a surprisingly effective marketing strategy. Just make sure you start your funnel with a squeeze page and build up your offering as you go. Hyperlinks to contact pages, blogs and third-party resources. A bundle of products included as an offer. Usually followed by a Thank You Page or Up-Sell. One image, and one form. Usually followed by a Thank You Page giving you further free support. How do I create an enticing squeeze page? A trial of the software. If you’re in the market for a squeeze page builder, you’ll need something that can adapt to your market. A builder with limited templates and design options is not going to result in a high conversion rate. It cuts the costs of marketing right down, as it does everything you could ever need. You don’t need to spend time swotting up on CSS and HTML to sculpt out your pages. There’s no need to hire a team of developers, designers and content writers to ensure your pages are a success. Clickfunnels gives you those resources, all part of the service! Of course, we’d like to invite you to sign up to a ‘14-Day Free Trial’ and give Clickfunnels a try before you buy! SIGN ME UP TO CLICKFUNNELS, FREE! Once inside the builder, you will find customisable templates that are perfect for beginners and marketing ninjas alike. The software has been used to create multi-million dollar funnels and continues to dominate the sector. You’ll also have access to a built-in delivery system complete with autoresponders, so that takes care of remarketing. At this point, you have chosen a landing page builder, so it’s on to creating a killer sales message to entice readers. This is surprisingly easy because you don’t need to be a professional content writer. The key is the keep it simple. Don’t overwhelm your readers with a detailed look into the features and specifications along with why they should buy from you. Your customers are the hero. A squeeze page tells them why the product on offer is made for them. You are the trusted side-kick, guiding your hero along a path to the sales button and the product of their dreams. To guide them, you need to explain why this product is going to help them. You can achieve this in a couple of sentences. ‘This Guide Is Proven To Help Cut The Costs Of Home Heating By 80% In A Few Simple Steps.’ This headline gets right to the point without needing an introductory paragraph. If you find you are writing more than a couple of sentences to introduce your offer, go back and ask yourself “what do my customers care about?” Include this as your headline to ensure your customers get the deal they want. Make your call to action pop! Finally, you need to include a call to action button. Remember, your website squeeze page is limited on space. You only have one shot at this, so make it count. More than likely your page is static, which means you don’t have the luxury of including multiple buttons as people scroll down the page. A good call to action will tell them what they are getting and how to get it. For example, “Yes, I Want My Free Guide,” “Give Me The Report,” or “Download Now” all of which include the product itself and the action. Buttons that do this are typically more effective than ones that simply say “Click Here” or “Yes Please.” There is no clarity. Our final piece of advice is to make your button stand out from the background. Let’s say your background colour is black, consider a red button. Taking a colour from an image and including it as your button colour will help connect your content. Above all, make sure it’s big and obviously clickable. Congratulations, that’s your website squeeze page complete. Having trouble building your website squeeze page? If you have questions about website squeeze page design or just need a nudge in the right direction, we’d be happy to help. As proud Clickfunnels affiliates, we have built many successful funnels, so our knowledge will go a long way. Send your questions to enquiries@bigfootdigital.co.uk or drop us a line on 01226 720 755 – we’d love to hear from you.